Research highlight 2013 of FOM programme 138: Stirring of light! 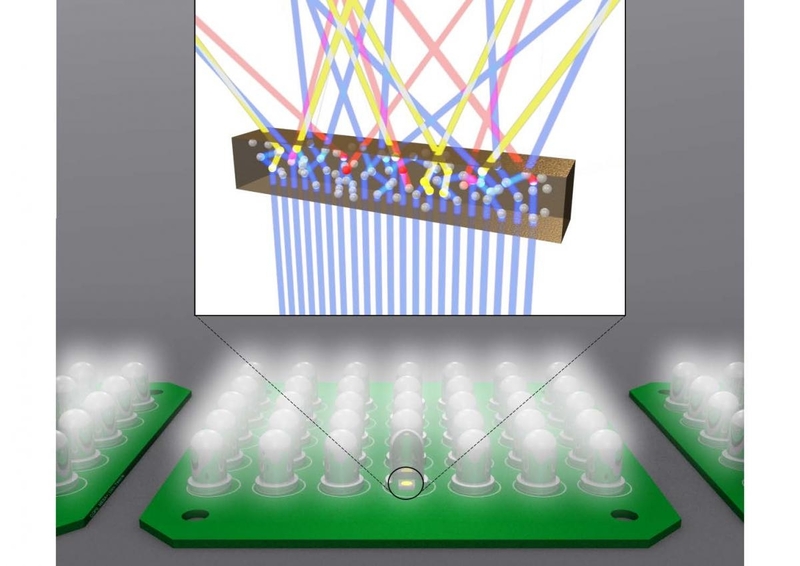 Physicists from the University of Twente in collaboration with Philips Lighting have developed a model with which they can predict the behaviour of white LED light far better than in the past. The model describes a vital process in new LED light sources: the diffusion of light in phosphorus layers. With the new insight, scientists can design the phosphorus layers in a more targeted manner. This will result in more energy efficient and less environmentally harmful light sources. The researchers developed their model on the basis of theory and experiments. White LED light arises when blue light from a semiconducting diode travels through a thin polymer layer that contains phosphorus particles. Not all of the photons travel directly through the polymer layer. Many photons collide with phosphorus particles and therefore become scattered. Most of the photons collide more than once and therefore make a so-called random walk (staggering like a drunk) through the polymer layer. In some collisions a photon loses part of its energy, as a result of which its wavelength increases and its colour changes. As photons randomly collide, a wide spectrum of colours arises: this mixture yields the white light. The random walk also ensures that the light is diffuse. The result is therefore a uniform white LED light. By making smart use of the scattering particles, the colour conversion can take place very efficiently as result of which less environmentally harmful materials are needed. An outstanding problem though was that up until now, scientists could not easily model this scattering from first principles. The design of a new white LED light source was therefore a time-consuming and expensive process. To realise a better physical description, the researchers made measurements on polymers with a range of concentrations of light-scattering nanoparticles. They illuminated the material with a white light source and measured the scattering characteristics. From this they derived the average free path of light: the average distance that a photon travels between two collisions. The researchers then developed a physical model to predict the scattering characteristics of the nanoparticles. A comparison of the measurements with the predictions revealed that especially clusters of particles have a major effect on the dispersal. A good description of the effects of these clusters will not only provide new knowledge but possibly better white LED light sources as well. Read the highlight about this research in Nature Materials here. Artist's impression of the scattering of blue light from a semiconducting diode. In a scattering medium, the light is converted into a spectrum of colours to provide a source of diffuse white light. Source: Complex Photonic Systems (COPS), University of Twente.